OmniGraffle Pro 7.4 – Create diagrams, flow charts, and more. OmniGraffle Pro helps you draw beautiful diagrams, family trees, flow charts, org charts, layouts, and (mathematically speaking) any other directed or non-directed graphs. We’ve had people use Graffle to plan plotlines for a story, make an overview of an operating system, show the evolution of computers, and even show how diseases can spread in a closed population. If you want to organize your thoughts, your projects, or even your friends graphically, using boxes and lines, OmniGraffle is your tool. OmiGraffle Professional has all of the great features in the standard version, plus a powerful toolset for advanced document creation and editing options. For the pro user who’s looking for an in-depth diagramming application that’s still priced below the competition, you’ve come to the right place. 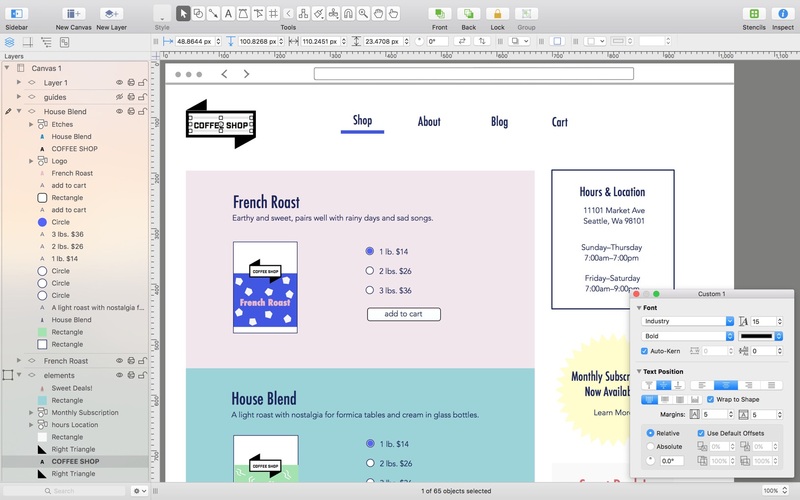 Canvas Size Modes: OmniGraffle 7.4 adds three distinct canvas sizing modes: Fixed, Flexible, and Infinite. Fixed lets you define the exact dimensions of your canvas. Flexible lets you select any direction you want the canvas to grow in and only extends your canvas enough to hold all your objects. If you want infinite canvas space there is also a dedicated third Infinite Canvas mode that extends your canvas in all directions regardless of where your objects are. Canvas Padding: When using the Flexible mode, OmniGraffle offers a Canvas Padding option to the Canvas Inspector that controls how much extra padding is provided between objects and the edge of the canvas. Automation Plug-Ins and Actions (PRO): With Pro you can save bundles of scripts (called plug-ins) for quick access from the Automation menu in a document and call scripts as Actions on objects. Copy from the Stencil Window: Added the ability to copy stencils from the Stencil Window and paste them on the canvas instead of dragging and dropping them on the canvas. Presentation Mode: Added limits to panning in Presentation Mode to prevent content from moving off screen. Line Endings: The menu of line endings in the Line Inspector now have a label for each type of line ending. New Artboard Under Selection: The Make Artboard command has been renamed to New Artboard Under Selection and now wraps the selection exactly instead of rounding to the next whole pixel. Keep Tool Active: Fixed a bug preventing the "Keep tool active" preference from working. Inspectors: Fixed a bug that caused inspectors that were hidden to show no data when opened and an object was already selected on the canvas. Stroke Corners: Fixed a bug that caused stroke corners that aligned with bounding box corners from rendering in the correct stroke corner type. Grouped Lines: Fixed a bug that prevented changing line attributes when the line was in a group. Fit in Window: Fixed a bug that caused the Fit in Window setting to remain active after changing zoom level. Print Canvas on One Page: Fixed a bug that was preventing objects in negative space (above or to the left of the origin) from printing when the "Print canvas on one page" option is enabled. Overlapping Artboards: Fixed a bug that caused content on top of two or more overlapping artboards to move unexpectedly when both artboards are moving. AppleScript: Fixed a bug that caused the sidebar to refresh too often when adding content via AppleScript. Stability: Fixed a crash that would occur when undoing a change to an adjustable star. Next story System Monitor 1.72 – Activity monitor from the maker of TinkerTool. Previous story Boom 3D 1.0.2 – 3D surround sound and phenomenally rich audio. OmniGraffle Pro 7.2.1 – Create diagrams, flow charts, and more. Sketch 45.2 – Design app for UX/UI for iOS and Web.